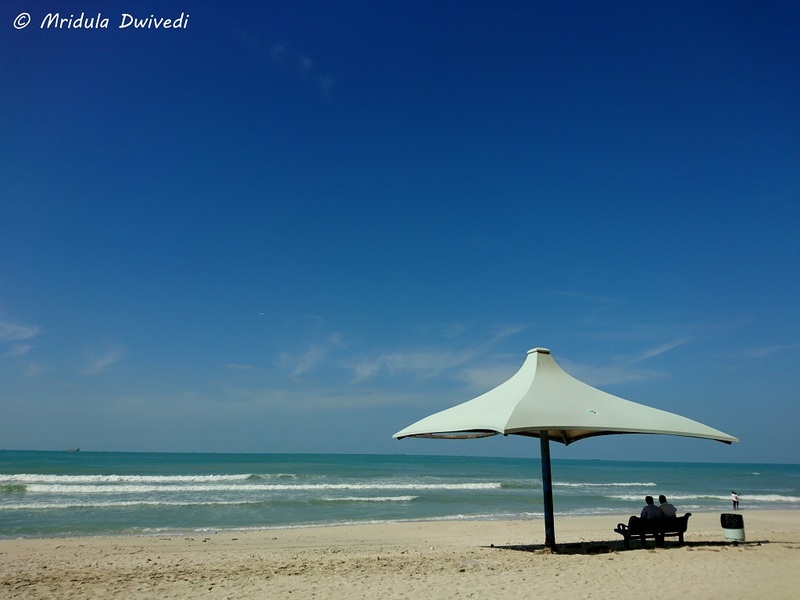 I sat down to write how to travel from Sharjah to Ajman by bus! And then I realized that all I know is that I traveled between the two points somehow! I didn’t have data on my mobile in Sharjah and that I can now say is a handicap! I didn’t know the distances or time that it would take. 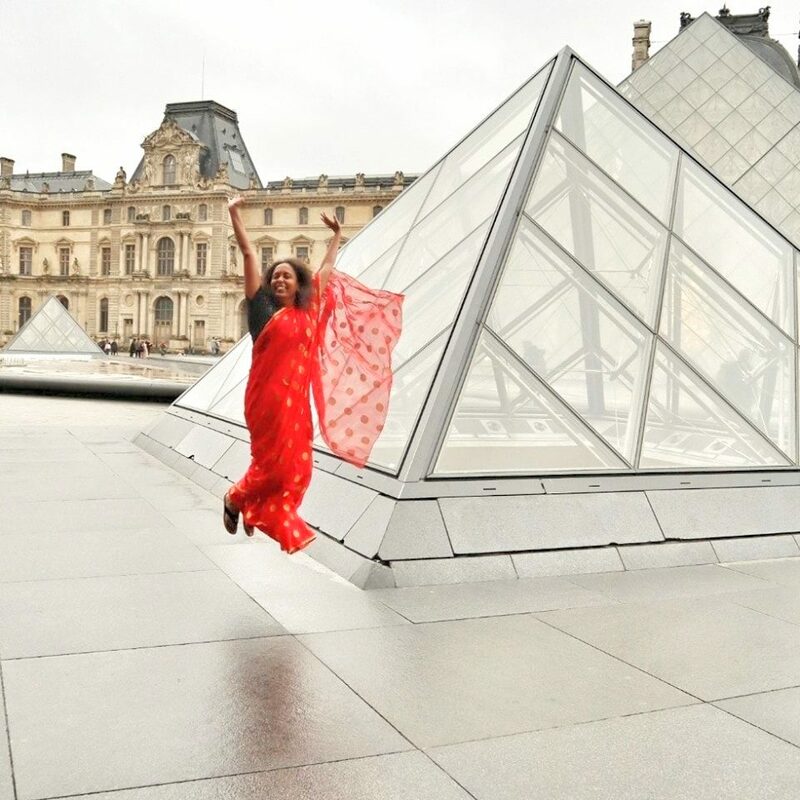 The trip happened more due to serendipity than anything else. I was standing at the Central Souq in Sharjah when I noticed a Hop On Hop Off (HOHO) bus. A friendly Filipino girl came out of the bus and told me they had an Ajman Tour too. It interested me, Ajman is closest Emirates to Sharjah. But as the HOHO Bus had one hour service between two points in Ajman, I gave it a miss. I moved on, and walking randomly I exited close to Al Jubail Bus Station in Sharjah. At the spur of the moment I decided to go to Ajman. I tried to find the ticket counter at the bus stop. I was told by a friendly soul that I could buy a ticket on the bus! I boarded a bus that said Ajman. The staff asked me where I wanted to go in Ajman and I said “city center” meaning the center of the city. They directed me to another bus. The staff in the other bus spoke with me in Hindi or Urdu as both sound similar. I requested them to tell me when to get off. The fare was 5 Dirham. In the Sharjah buses the ladies seats are at the front. Which bus was that? I didn’t notice the number. But I can say for sure that even if you appear clueless, like me, at the Al Jubail Bus Stop they will still guide you to the correct bus. When my stop came, the driver told me. I realized City Center was a mall and not the city center of Ajman, not sure if it is in Sharjah or Ajman! But where ever it is, it is close to the Ajman Beach. I asked a person in the mall who tried to sell me gold about the Ajman Beach. He said I could take a taxi from outside. 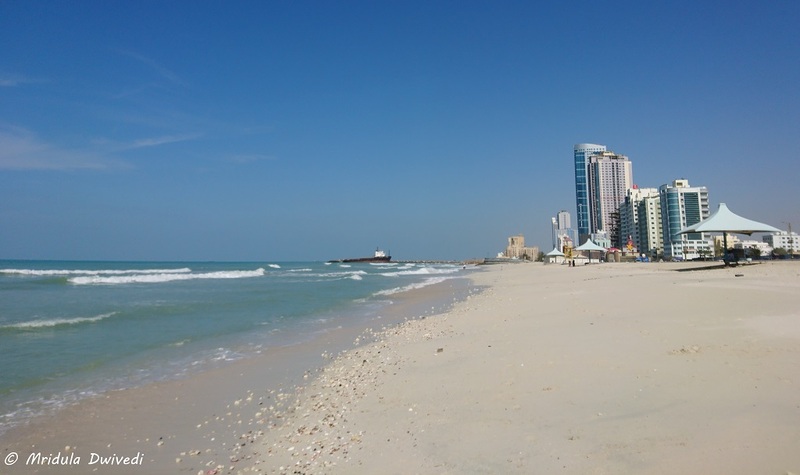 The trouble was I didn’t exactly know where I wanted to go and how big was Ajman Beach! Anyway I hailed a taxi and told him I wanted to go to the beach. I also told him I was new to the city and I was looking for lunch. He was a Pakistani, most of the taxi drivers are. We amiably chatted till I reached the beach. I also asked him where could I take a bus back to Sharjah? He told me to hail any taxi and ask them to drop me to a Sharjah Bus Stop. I went to walk by the beach a little and then sat for lunch. After lunch I hailed a taxi, again the driver was a young Pakistani. I told him I wanted to go back to Sharjah by bus! He stopped at a bus stop and told me to go and ask if it was the correct bus. It was a road side stop with two buses waiting. I said I would pay, but he said no go ask first and if it is your bus come back and pay. Or else I will drop you to Sharjah. It was the correct bus. I told the bus driver not to go as I had to pay the taxi. His assistant threw some tantrums saying the bus was leaving but I told him I had a flight to catch. I ran back, paid the taxi, thanked him and boarded the bus. I know this was bus no 14 but I do not know the name of the bus stop in Ajman from where I boarded it! The bus ride was uneventful otherwise. It dropped me close to Al Jubail but it didn’t go inside the terminus. I realized it was a city bus! There is a city bus service up to Ajman! Now I only need to find the correct routes and go there next time without taking any taxis. Or else I could actually take a taxi all the way to the beach, it is not that far from Sharjah, according to Google Maps it is less than 10 kilometers! Also you can see how good I am at giving directions. If you would follow my advice, to go to Ajman by bus, Al Jubail, Sharjah could be your starting point. Once you turn up at Al Jubail just ask around! But there are many stops in Ajman so know where you wish to get off! If you need more precise directions, ask someone else! I guess I am cheating a little today. I picked this picture for Sky Watch Friday more because of the overloaded bus rather than the sky. But it has blue sky too, won’t you agree? But then it has been one of those weeks where it feels weekend came after five rather than the regular one week. So you have to give me some sack. Also I thought the saying on the bus was great ‘100 में से 80 बेईमान फिर भी मेरा देश महान’ (’80 out of 100 people are corrupt by still my country is great’ is a rough translation). I was coming back from a wonderful stay at the Jaipur Marriott. We were not very far away from reaching home. I was feeling quite lethargic by now, a bit impatient too. After all it is at the end of the journey when you wish to reach home fast. 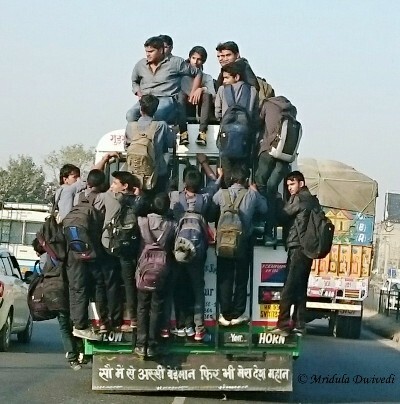 And then I witnessed this scene on the Jaipur-Delhi Highway. A Bit of Blue Sky Too! I hesitated initially because if the passengers notice someone clicking a picture, particularly a woman, they can start shouting and hooting. And I was in no mood for that. But then the scene was too delicious to let go without an attempt. No one noticed me clicking the picture from the car. I guess the boys were too busy holding on to their dear life! But the biggest coincidence was when I posted this on Facebook and my sister shared it. One of her friend’s said the students were from the polytechnic where she is a teacher! She had some very sharp words to say about this habit of her students. Of course there have been accidents in the past. But then it is indeed a small world, where you click a random picture and someone finds a connection with it!